This replacement mirror is just what you need to get your Impala in good looking form again! Remove the Phillips screws from the door panel. Remove the two T27 screws from the armrest. Remove the armrest and the T27 screws under that. Pry out the door handle bezel and disconnect the harness. Using a putty knife pry out the clips around the door panel (use a rag to avoid scratching the paint). Remove the three 10mm bolts securing the side mirror. Pull the side mirror off. Run the harness through the door. Put your mirror in place and replace the three 10mm bolts. Clip the door panel to the tabs on the top of the door. Replace the two T27 screws. Reconnect and replace the armrest and the two T27 screws. Reconnect and replace the door handle bezel. Replace the two Phillips screws. Bought this mirror for my Impala and was impressed with the design which matched my old mirror quite well. The fit was exact and operation works as it should. Had it painted at a local body shop and it is hard to tell the difference from the old one. 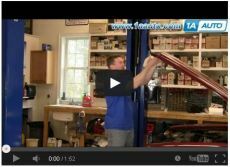 Nice job 1A Auto on the part and the installation video! This worked perfectly!! I saved so much money ordering from 1A Auto. So very happy and easy to install! what color are the mirrors? The 2 that I have gotten have been flat black. They are black. Not ideal for my burgundy car, and ive had to replace the mirror twice, but $40 is better than paying a mechanic and searching every scrap yard for the right color and in good condition. These mirrors are coming as a standard black.